Meet the all-new Audi RS 4 Avant. 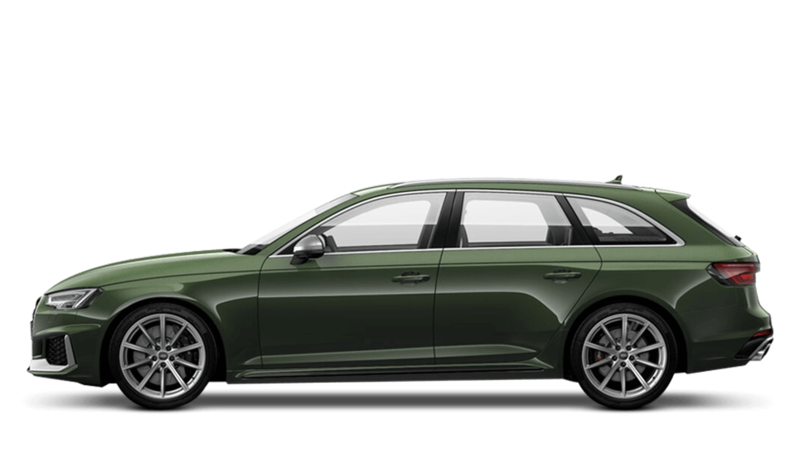 Bigger and better than before, the RS 4 Avant is sleeker and smarter, now with wider wheel arches for a more impressive performance on the road. Boasting a fierce 2.9-litre Twin-Turbo V6 engine, the RS 4 Avant achieves a 0-62mph time in an astounding 4.1 seconds. Featuring the latest Audi engineering and innovative technology, you can enjoy the thrill of your life. Visit your local Audi dealership in Essex, Hertfordshire and London to find out more about your dream car – the all-new Audi RS 4 Avant. Every detail matters, view the Audi RS 4 Avant technical specification. Designed to reflect its performance, the all-new Audi RS 4 Avant has a road presence like no other. Using the same basic bodywork of the A4 Avant, the RS 4 Avant features Audi’s iconic sleek lines for a sharp look. The wheel arches have been stretched by 30mm, generating more grip on the road, especially when it comes to cornering. Look like you mean business thanks to Audi’s unmistakeable large honeycomb front grille and eye-catching headlights. Dual aluminium exhaust pipes adorn the rear, giving the RS 4 Avant a muscular appearance, which is further emphasised by the wider wheel arches. Beautifully designed on the inside and out, the all-new Audi RS 4 Avant exudes luxury down the very last inch. Inside the RS 4 Avant’s cabin, there are plush materials and refined finishes around every corner, carefully caressing the sophisticated lines that flow throughout the cockpit. Aluminium detailing highlights the RS 4 Avant’s sculpted curves and sleek lines, while the luxury perforated leather steering wheel ensures the utmost comfort during even the longest of journeys. Indulge in premium styling and first-class materials for the ultimate driving experience with the Audi RS 4 Avant. Engineered to perform better than any other vehicle in its class, the all-new Audi RS 4 Avant is in a league of its own. It may come with only one engine, but the 2.9-litre Twin-Turbo V6 engine is all it needs. Producing up to 450bhp, the RS 4 Avant excels, reaching 62mph from a standstill in as little as 4.1 seconds. Achieving a combined fuel consumption of up to 32.1mpg, the RS 4 Avant is everything you could ask for. Its finely tuned performance is thanks to the Quattro all-wheel drive with Sport differential, which reacts fast around tight bends, keeping you in control at all times. Audi hasn't held back. The all-new Audi RS 4 Avant is full of smart in-car technology, making your driving experience more enjoyable than you ever thought possible. Featuring Audi’s latest Audi Virtual Cockpit, the RS 4 Avant provides all the information you could possibly need. The 12.3-inch all-digital display transforms, presenting you with RS-specific performance details. It also comes with all the infotainment features you need to keep you and your passengers entertained throughout the journey. Experience the future of Audi driving with the all-new Audi RS 4 Avant. Live life in the fast lane – introducing the all-new Audi RS 4 Avant. Estimated to be priced between £60 to £70k, with UK deliveries due to take place in early 2018. Register your interest today! Register your interest for the new Audi RS 4 Avant at your local Audi dealership in Colchester, Chelmsford, Chingford, Finchley Road, Harold Wood, Hatfield, Stansted, Southend, Whetstone and Watford. Enquire now for more information. of customers that bought an Audi RS 4 Avant would recommend to their friends and family. I was pleased with Chelmsford Audi and would recommend them because of the flexibility from staff and varied selection of vehicles. The experience at Stansted Audi was good because Andrew Russell was very good to deal with. Didn't oversell or too pushy, answered all my questions promptly and generally nice to deal with. Explore the RS 4 Avant specifications.